To Dog With Love: Happy Birthday Petfinder! Help Petfinder Adopt the Internet today! Happy Birthday Petfinder! Help Petfinder Adopt the Internet today! Today is Petfinder's 15th birthday and to help them celebrate, animal lovers from all over are helping Petfinder Adopt the Internet by posting, tweeting, blogging and spreading the word about pet adoption. Today we're featuring an adoptable pet from one of our local shelters. 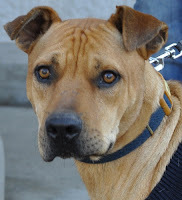 Please meet Buckwheat, a handsome Shar Pei/Retriever Mix from the Atlanta Canine Adoption Project. Buckwheat was rescued from a shelter as a very small baby, just a few weeks old. He had been so neglected that he had almost no hair at all. As you can see from his pictures, he now has recovered fully since being rescued and has a beautiful, soft coat that is the color of a field of wheat! 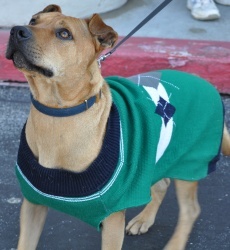 Buckwheat is good with other dogs, people and cats! More on how to adopt Buckwheat here. Buckwheat is featured on the Petfinder Adopt-the-Internet All-Stars gallery where you can find a number of great pets ready to be adopted. Happy Birthday Petfinder! We're honored to help you celebrate 15 great years of helping find forever homes for more than 17 million pets across North America from 13,000 different shelters and rescue groups. Well done my pals! On a different note, Wagging Tails and Ales at Atlanta's Piedmont Park dog park has been postponed from tonight to tomorrow night due to rain. We'll see you there tomorrow night!